Lightyear's Track MX5 back up car. 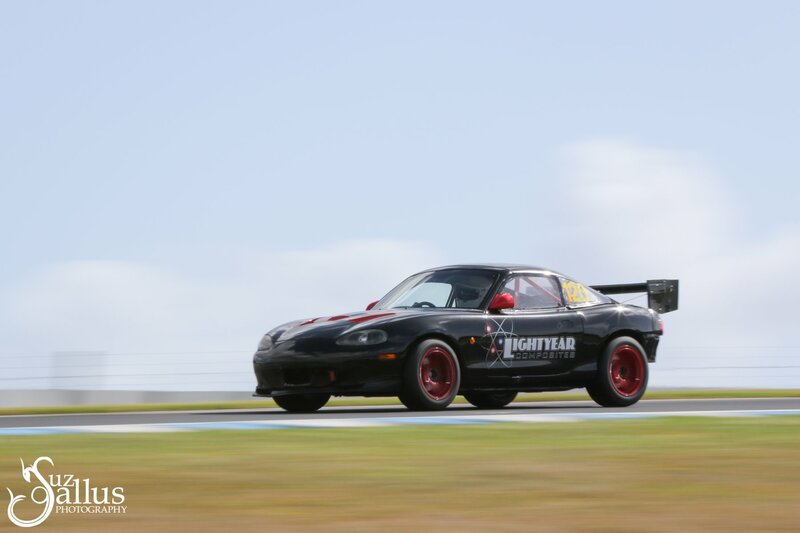 Thread: Lightyear's Track MX5 back up car. Then 2 hours later it looked like this. Since I scrapped the other NB, I had to put the steel doors back on this car so I can use it to assemble the fastbacks. Figured I would convert it back to more of a road car. It's never going to be comfortable, but should be fun on a wet road or use it to go to a car meet or track event. Last edited by lightyear; 09-10-18 at 06:35 AM. Does look the goods still. Which reminds me, i need to come grab that gear from you. It's back on the road. This time as a loaner. You've produced some really good gear over the years mate, the fastbacks look awesome. Where are you at with production of these and/or the lightweight fibreglass hardtops? So I am picking up all the moulds. I will start making the Oem shape carbon fibre hardtops again soon. Not sure where the fastbacks production is going. But I will look into finding another shop that needs the work. They all seem to be too busy. Just use the A/C lol. It actually had working A/C, but was deemed too heavy. Last edited by lightyear; 24-10-18 at 06:05 AM. I will start making the Oem shape carbon fibre hardtops again soon. I took this to the WRX track day at Phillip island last weekend, also an MX5 club round. I had one morning to get the car more track ready from the loaner set up. First thing was to throw the carbon fibre doors back on and the wing. I didn't have time to put the track front bumper on, so just used race tape on the Oem front bumper. Bolted the track wheels on, and that was it. The most fun part of driving this car is turn one flat to the floor. It is exhilarating when you run over the curb at the apex, it just feels fast. There is a fantastic amount of feedback from the steering wheel, you really need to hang on. I ended the day with a best of 1:51.8, about as good as I expected. And I was the only car to do over 30 laps out of 120 cars. It's cheap to run and reliable. But like they say, you can have 2 of 3 in the cheap, fast, reliable triangle. Mine misses out n the fast.. The car just doesn't have the power of the old red car I had a few years back that did a 1:50 flat. I think the extractors might be to blame. There are 2 bits of half pipe about 50mm long inside where it goes 2 into 1 that must cause a lot of interference. It would only take me an hour or so to cut the extractors at that point, the bits would fall out, then just weld it back together. I got the second fastest time if you don't count Brendans turbo MX5. Pretty much what I expected again. Last edited by lightyear; 25-01-19 at 04:49 AM. Last edited by lightyear; 25-01-19 at 05:20 AM. This was parked next to me at work a few days ago (Caboolture in Qld). One of yours? Sure is, but what are the chances of seeing one in the wild? I got to say the way it flows into the rest of the car and the quality of the fitment was really, really good. Only the Perspex quarter glass gave it away. Very, very impressive. Pretty sure I saw that car by the beach at Margate/Woody Point along with another early MX-5 (green with gold stripe) in the last couple of weeks. If you dig a hole and it is in the wrong place, digging it deeper isn't going to help. Police warn that blow-up dolls are not recognised floatation devices. Last edited by bbeavis; 27-01-19 at 06:30 PM. I took the car out again today to Phillip Island. This time I removed the wing completely, and found a bit of ~20mm plastic angle to stick on the back of the "spoiler" to stop any lift. It seemed to do the trick. And I bolted the alloy angle side skirts back on.. The car did a 1:51.5 with no wing, and no front splitter or airdam. Pretty happy with that. I think I found some more shortcuts around the track. Or maybe I just tried even harder to drive the wheels off the car, seeing as it's the last time out with the slow running gear in it. This kind of car really teaches you how hard you need to push to get that little bit faster. I have plenty of entertaining video with me sliding all over the track, or passing fast cars. Only to have them catch me going into the next corner thinking they are going to get back in front. Biggest drama of the day for me was the brake lights failed half way through the day. With some help from the gang we rigged up a new positive wire. Thanks uncle Al. Next time you see the car on here, it will have over double the HP. Here is a non stolen pic for a change. Last edited by lightyear; 11-02-19 at 05:20 AM. So you took the wing and the front air dam and splitter off, and went 3 tenths quicker than the last two times you'd been out in it? Yep. Well last time it had this bumper, and the smaller rear wing set up, but no side skirts. I dropped the AOA down one hole every session last time out, and at the end of the day the wing was at minus 10 degrees or more. Looked ridiculous, but did the fastest lap time. This time I do need to lift a bit at T1, but higher top speed. This motor doesn't have enough power to drag a wing through the air, so the benefit just isn't there. Look, I don't think it's slower with the wing, but it's not faster. There was a decent tail wind down the straight, and I did find some time at T10 trying a new line. So it's roughly the same with or without the wing. My tiny plastic angle on my Camm tail might have helped a little too. Will be following with interest. Would love to go to The Bend at some point. Thinking it might for for the SA Time Attack event, maybe in 2020. I have pulled out the entire running gear and subframes. The turbo motor and running gear is now in. I spent a bit of time swapping over all the sensors, wiring, fuel rail, alternator, etc so that that it plugs into this chassis. I will get the basic set up done, then get Nick to help me finish it off. Should be ready to do its first track day in March. Cheapracer II, but with actual cars??? ?